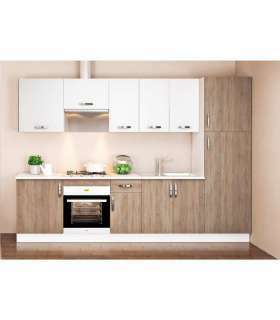 Mueble cocina de 60 altillo para colgar con 1puerta. 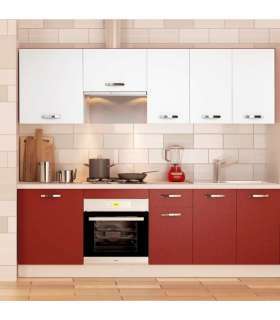 Full kitchen nice design and at an incredible price, in our store have what they looking for. This kitchen is available in three colors: Bordeaux, Wenge and oak of 2.40 metres. Includes socket and Hob. This kitchen has everything you need and with very nice colors. Metal hinges of 26 mm. Metal handles chrome gloss large format. Metal drawers with metal guides. Adjustable feet in black plastic. Melamine from the town of 16 mm. Ridge seen from PVC of 0.4 mm. Melamine door with textile finishing of 16 mm. Edge of the door 1.0 mm. Rear 3 mm single-sided painted. Easy mounting with clear instructions.